I like sharing with you the breakfast dishes I grew up with in my native Slovakia. Breakfast recipes are not exactly complicated, and I bet many recipe sites don’t even bother posting them. But I like sharing breakfast concoction because I find it interesting how different many of them are from their North American counterparts. So far, I’ve posted recipes for sweet cinnamon grits (or farina), eggs on fried ham, salty French toast, scrambled eggs with mushrooms, and one of my favorites, bread with radishes. Here is another breakfast that was popular in my family when I was growing up. It’s oatmeal or ovsené vločky. 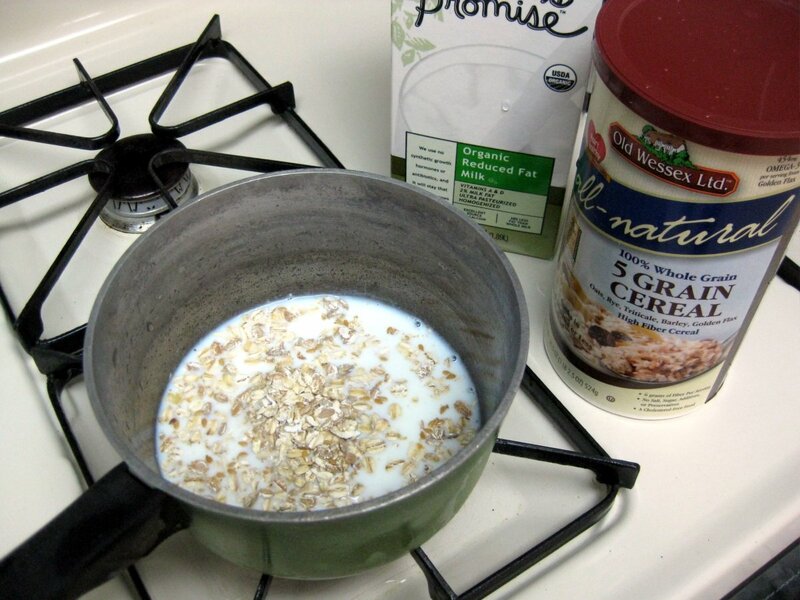 Oatmeal is a porridge made from oats (ovos), type of cereal (obilniny). Cereal does not mean sugary puffs that come in a box with cartoon characters on them. In fact, sugary breakfast cereals were completely unheard of in Czechoslovakia during my childhood. I remember quite vividly trying them for the first time here in the United States and not knowing quite what to make of them. Instead, cereals are grasses with large edible seeds (or grains) that can be turned into flour, porridge, and many other products. Corn (kukurica) is the most common American cereal. Wheat (pšenica) is another common cereal which is used to make flour. If the entire kernel is ground up, you end up with whole wheat flour. If the skin and the germ (the “embryo” part of the seed) are removed first to retain only the starchy endosperm tissue, you get the white flour. Grind up the wheat kernels in some other way and you get farina (or cream of wheat). Farina is basically the same thing as grits, except made from wheat instead of corn. And oats are just another type of a cereal. They are grown mainly as livestock feed, but are also very popular with us humans. Not only do they taste good, they are also very healthy. Oats are believed to lower the bad (LDL) cholesterol and they also contain more soluble fiber than any other grain, which helps slow down digestion and also make you feel full faster. I prepared this “oatmeal” from a combination of five different grains. My local grocery store carries an awesome tub full of five grains, oats, rye (raž), triticale (wheat/rye hybrid), barley (jačmeň), and golden flax (zlatý ľaň, flax has also been used historically to make linen, along with hemp, konope). The tub costs only $2.50, and is plenty big for at least two dozen breakfasts. 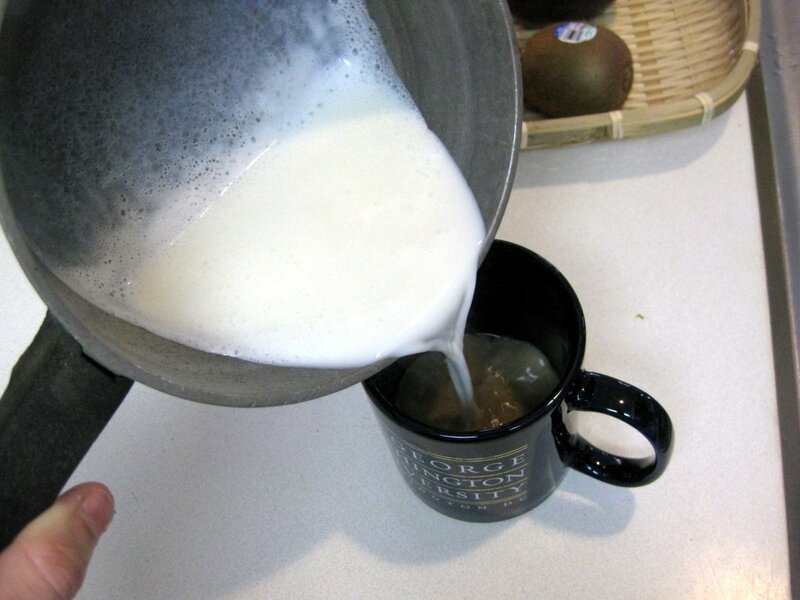 The instructions said to cook the grain in water, but I prefer milk. In a pot, combine quarter cup of cereal with about the same amount of milk. 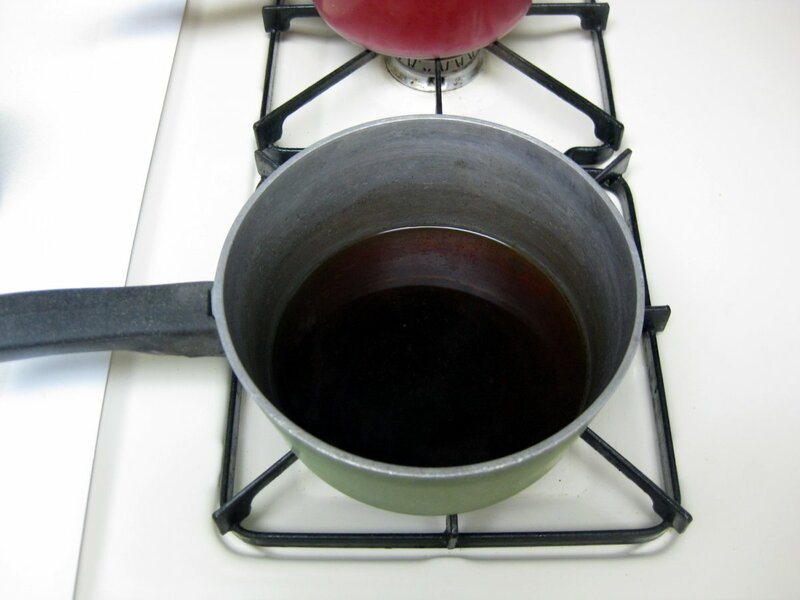 Bring to boil but be careful not to burn the milk – turn the heat down when the milk (mlieko) starts getting close to boil. Cook for about 5 minutes, stirring, until the porridge thickens. In the meantime, prepare you favorite topping. 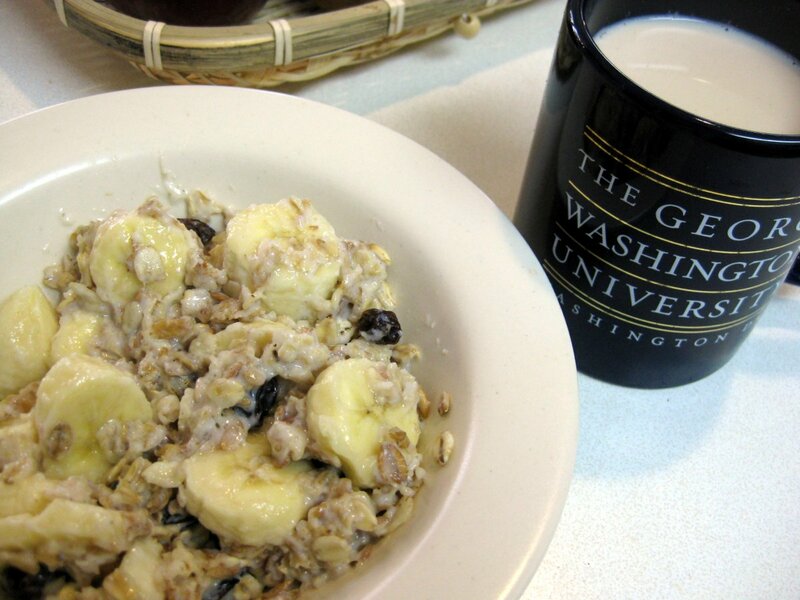 I like my oatmeal with banana and raisins. 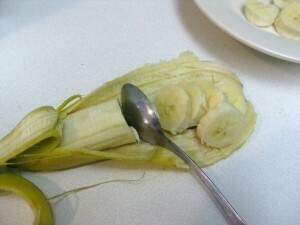 As you can see, I don’t bother using a knife for slicing – a spoon will do. 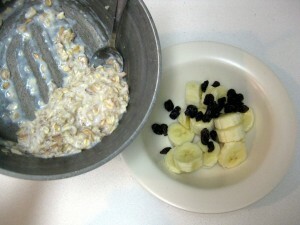 Once the porridge is thick enough to your liking, mix into the bowl with your choice of fruit. I don’t add any sugar, I find the sugar from the fruit sufficient. This dish is quite delicious with white coffee. Start by making coffee. 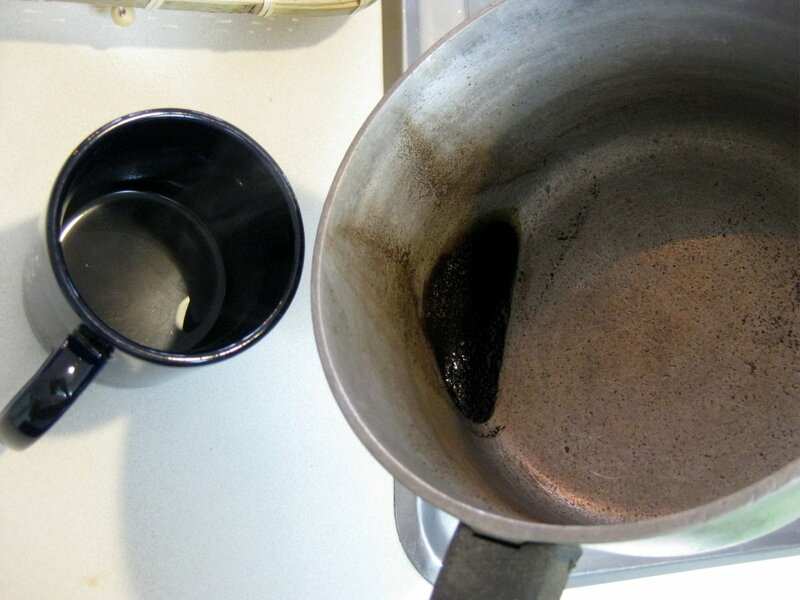 Coffee maker is fine, but I don’t like the taste of coffee from those. For some reason it tastes very acidic to me. So I either use a French press or cook the coffee directly on the stove top. The secret is to use finely ground (espresso grind) coffee. This way, the grinds will settle to the bottom, and you can just pour the broth into a cup without needing any filters. You want the mug to be about 1/3 coffee. The rest is hot milk. And sugar. I used two teaspoons. Delicious! The ‘white coffee’ reminded me of my Baba and her “coffee soup” that we were allowed to taste. It was white coffee with bits of bread in it. What a happy memory you gave me. Thanks. I am so enjoying your website…I have forgotten most everything I knew about the Slovak language…which wasn’t a whole lot! I love sounding out the words and having the light bulb come on and remembering my mom and grandmother speaking.